Thank you to Karrie Valauri of AARP Foundation WorkSearch for submitting this very timely information for our blog. 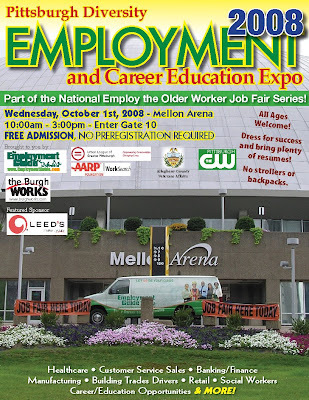 The Pittsburgh "Hire the Older Worker" Job Fair, part of the national series of job fairs in partnership between The Employment Guide, WiserWorker.com and the AARP Foundation WorkSearch, is coming October 1st at the Mellon Arena. Interested in Remaining Marketable in the Workforce? By 2010, one in three workers will be over the age of 50. As the relative proportion of younger workers declines, attracting and retaining experienced and reliable workers will be as important as ensuring that experienced workers are prepared to meet the skills in demand of the 21st century workplace. AARP Foundation is dedicated to creating new opportunities for individuals to re-enter the workforce or to remain in the workforce. To assist individuals with obtaining and maintaining the needed skill sets for employability today and in the future, AARP Foundation has developed WorkSearch Programs. AARP WorkSearch Assessment is an on-line instrument that helps the experienced, mature worker remain in or re-enter the workforce. It identifies work interests, personal characteristics and transferable skills. It offers quick tests to determine if one has the right skills for a job, online training programs to fill skill gaps, and job opportunities by zip code. The WorkSearch Assessment System encompasses over 1200 job specific on-line courses, eighty of which are certified, and 75% of all job titles in the Bureau of Labor Statistics job bank are represented. It is available at no cost to experience job seekers of all ages and income levels. “WorkSearch is an excellent tool to help you to focus in on the type of job you want, to evaluate your skills and to recognize skill gaps,” said to Roberta Davis, Employment Specialist for WorkSearch. New job opportunities, however, often require additional skills, time and money. The right education and training can sometimes be out-of-reach, especially if you have limited financial resources. Through the Foundation’s Training Assistance Program – the AARP Foundation is providing financial support for training to adult workers (40+) who have incomes that are at or below the median income for their community, and who are interested in training to remain in or re-enter the workforce. Because not everyone has the same interests or learns the same way, the AARP Foundation has established a number of different options, including on-line learning, classroom, and employer-based training to help people gain the skills they need to be competitive for today’s jobs. Mature workers are being certified in many disciplines through the on-line certifications, including medical coding and billing, project management and technical writing. Classroom training has encompasses nationally recognized Customer Service certification, Quickbooks, and much more. Special on-line opportunities to obtain teaching certifications and bachelor’s degree in the accounting field are also available. The third program offered locally through WorkSearch is the Senior Community Service Employment Program (SCSEP). This service provides paid training opportunities for unemployed residents of Allegheny County who are 55 years of age or older, who meet income guidelines and are currently seeking employment. Individuals train at non-profit organizations to obtain the experience and skill sets needed to become more marketable. AARP is committed to assisting the mature workers with making informed choices regarding employment interests and options, and meeting employment goals. It recognizes that what we do today, we may not be interested in doing or physically capable of doing five, ten years from now. Our skill sets may not correspond to the needs of tomorrow’s employers. AARP Foundation also supports a National Employer Team for those employers who are interested in securing and maintaining a mature, skilled workforce. So whether you are an employer interested is retaining a mature workforce, or an individual interested in changing careers, remaining marketable, or re-entering the job market, learn more about how AARP Foundation WorkSearch can help you achieve your goals. Prepare today for tomorrow’s workforce…let AARP Foundation WorkSearch help you. Contact the local AARP Foundation WorkSearch office at 412-271-1580, or visit aarpworksearch.org. September 9, 2008 – Pittsburgh area employers expect to hire at a steady pace during the fourth quarter of 2008, according to the Manpower Employment Outlook Survey. 5% are not certain of their hiring plans. Transportation/Public Utilities and Wholesale/Retail Trade. Employers in Education and Public Administration plan to reduce staffing levels, while those in Services voice mixed hiring intentions. Hiring in Construction, Non-Durable Goods Manufacturing and Finance/Insurance/Real Estate is expected to remain unchanged. Of the 14,000 employers surveyed in the U.S., 22% expect to increase their staff levels during the October – December period, while 13% expect to reduce their payrolls, resulting in a Net Employment Outlook of 9%. Fifty-nine percent expect no change in hiring and 6% are undecided about their Quarter 4 2008 hiring plans. The next Manpower Employment Outlook Survey will be released on December 9, 2008 to report hiring expectations for Quarter 1 2009.